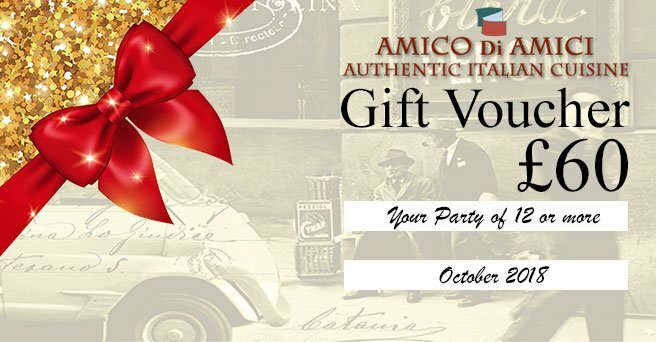 Choose the Red Lion Amico Di Amici for your Xmas Party and take advantage of our early bird vouchers when you book before 11th November. 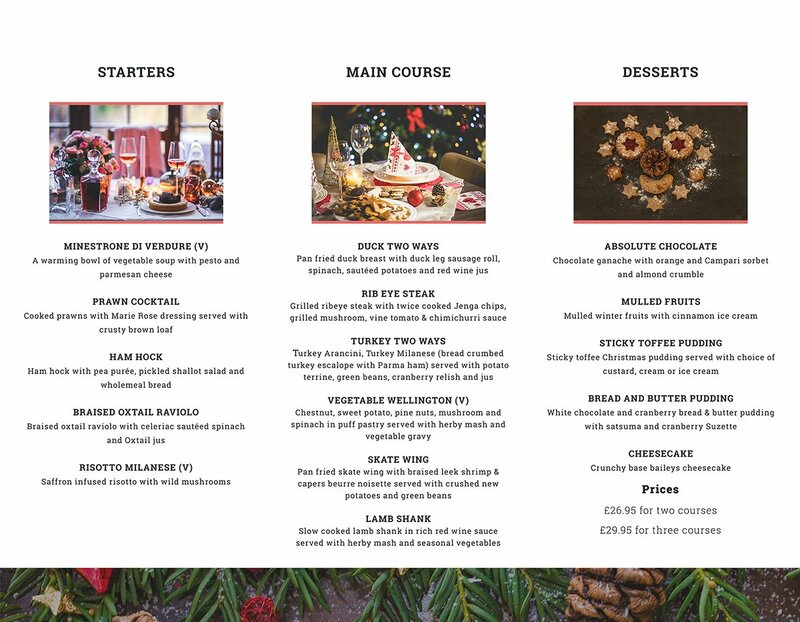 Our Christmas Fayre menu is available from Wednesday 28th November to Saturday 22nd December 2018. Prices include tables decorated with Christmas theme and crackers. Simply quote promo code EARLYBIRD when you book online or call us on 01920 410056. Vouchers are valid from 1st January 2019 for 90 days. £60 Voucher* when you choose from our Christmas Fayre Menu, and book a table for 12 or more people. £40 Voucher* when you choose from our Christmas Fayre Menu, and book a table for 8 or more people. £20 Voucher* when you choose from our Christmas Fayre Menu, and book a table for 4 or more people. A non refundable deposit of £15.00 per person is required to secure your reservation. All parties are to pre order their meals. Please submit pre orders 7 days prior to the booking date. Menu prices are per person. 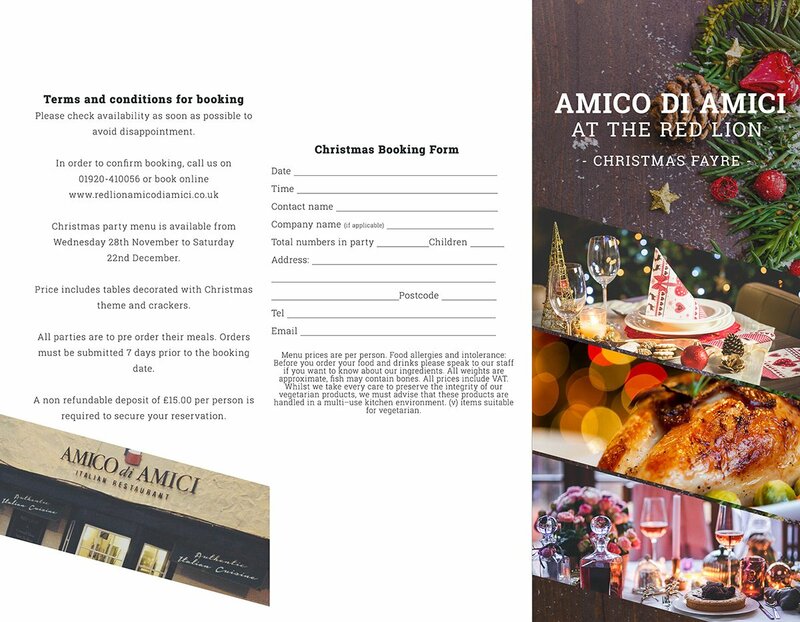 The Christmas fayre menu may not be used in conjunction with any other promotion or discount. Food Allergies and Intolerances: Before you order your food and drinks please speak to our staff if you want to know about our ingredients. *All weights quoted are approximate, prior to cooking. Some fish dishes may contain bones. All dishes are subject to availability. All prices include VAT. All photography is for guidance only. Whilst we take every care to preserve the integrity of our vegetarian products, we must advise that these products are handled in a multi-use kitchen environment. (v) Items suitable for vegetarians. Vouchers will be issued on the date of your booking. Offer closes 11th November 2018.